A summer with Auntie is never boring. But if you’re having a hard time keeping it that way, we’re here to help. Every Wednesday, we will give you new ideas to keep away the summer slump. From reading lists to outdoor activities, we will put enough on your schedule so that you can put on your own “Aunt Camp.” Stay tuned! 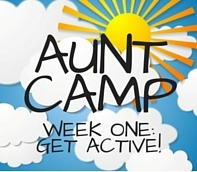 AUNT CAMP: Week One - Get Active! A hot summer with their cool aunt is never boring. But if you’re having a hard time keeping it that way, we’re here to help. Spend Week One of AUNT CAMP keeping them active. There are lots of fun things to do off the couch and outside the house. A long bike ride is a nice way to start! If they don't know how, it's the perfect time to teach them. If two wheels aren’t enough, try six: roller blading is something you can do outside and in (a roller rink is great for rainy days, if your town has one). If you want to cool off, head to the nearby ice skating rink, but get out on the ice with them! You'll have more fun and get more exercise being out there than watching from the seats. Not only do kids keep you feeling young, but they also keep you moving. If you show interest in staying active, they will enjoy it, too. Each Wednesday, we will publish a new AUNT CAMP idea to keep away the summer slump and keep kids - and you! - active! From reading lists to outdoor activities, we will put enough on your schedule so that you can put on your own AUNT CAMP. Stay tuned for more AUNT CAMP! Home Activities AUNT CAMP 1: Active!